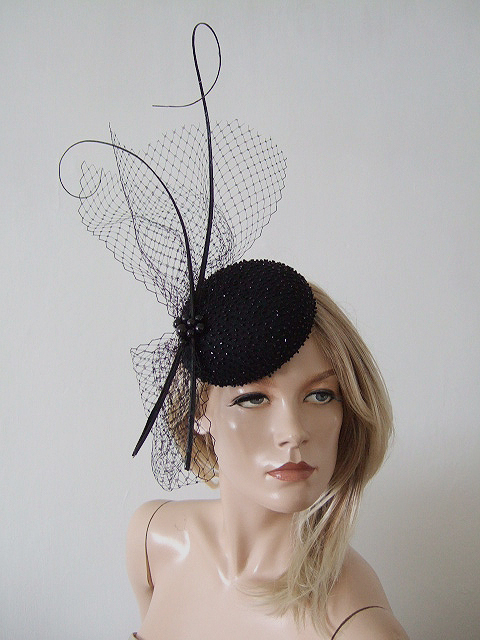 Beaded black headpiece, with Quills and Black Veiling Detail. This headpiece is a 5.25" Button Base, with all over black beading detail, with two crossing long curled ostrich quills, large Swarovski black pearls, and Black Veiling. A really pretty headpiece that will work well with almost any outfit..
Attaches by discrete elastic that you wrap under hair, and comb on the inside to secure. Beaded Base Measures 5.25"" diameter. Height of 14.5" and Width 7.5".